I haven’t done a dessert in a while because I have a very difficult time not “sampling” the wares when they come out of the oven. 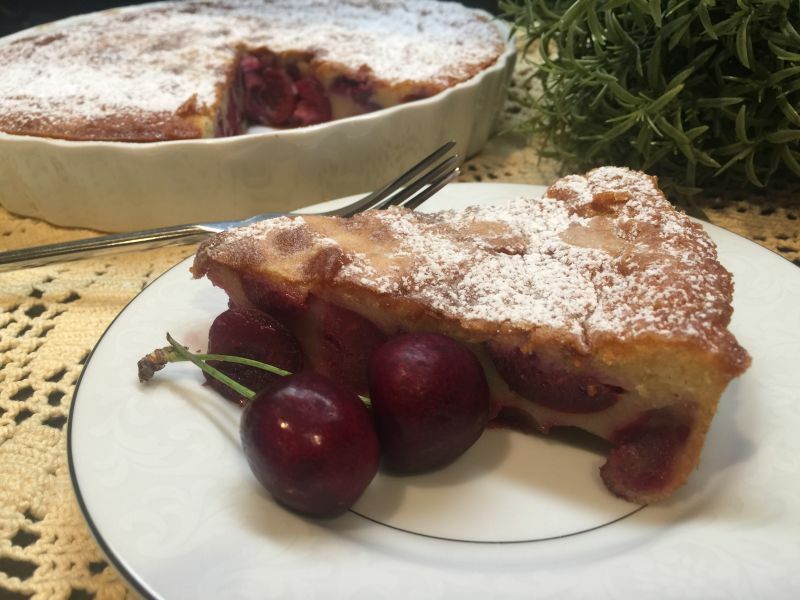 I want you to know that I have decided to embrace my curves and make the monumental sacrifice and whip up a decadent dessert this week – Cherry Clafoutis! California Girl Comments: The Brit perked up when you talked about French things and embracing curves. I think you are giving him ideas! 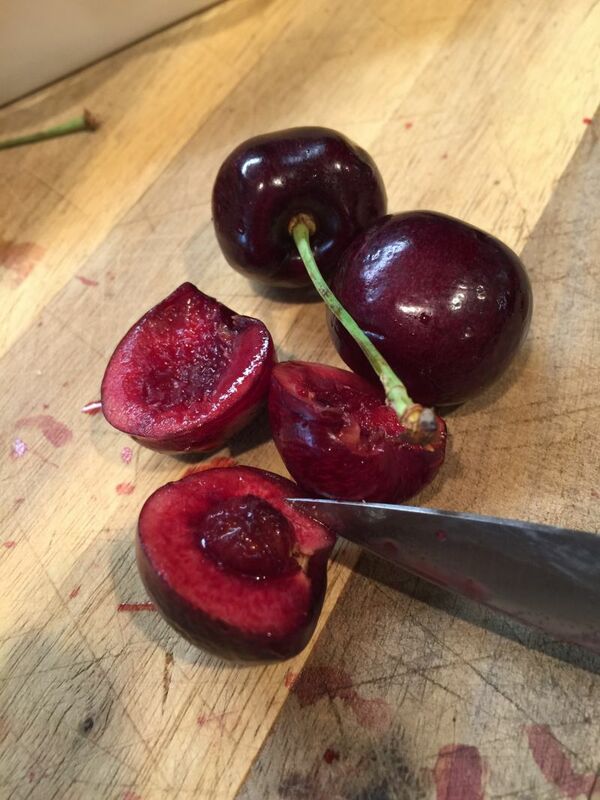 Mm cherry. This looks so fancy and easy. I will be making this for our next guests. 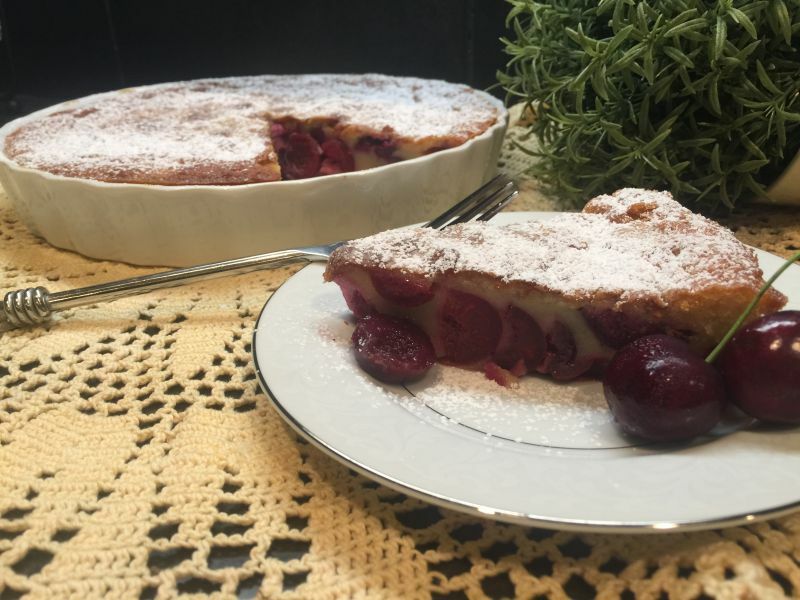 This week’s dessert is a rustic French dessert, called Clafoutis Aux Cerises. 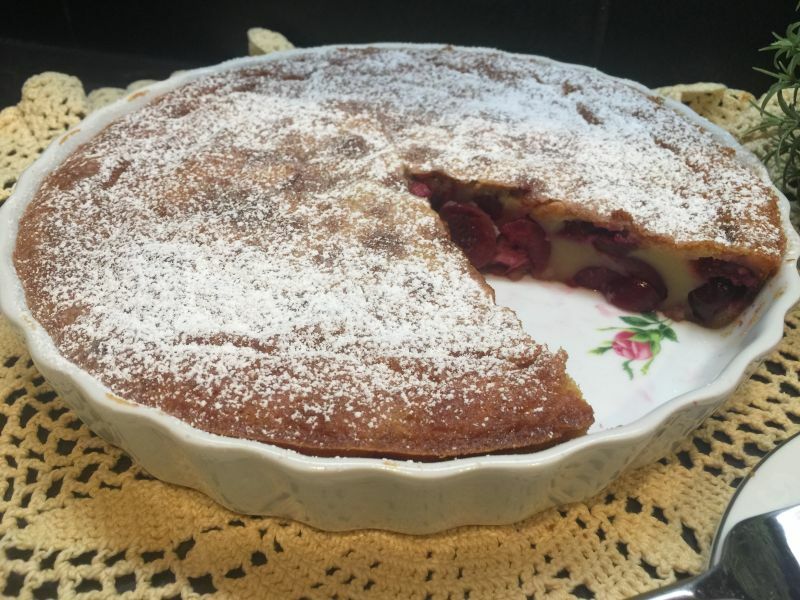 If you don’t speak French, you can just say Cherry Clafoutis. First, you need to learn to pronounce it…it’s klah/foo/tee. Now say it a few times… Excellent! The best part about this dish is that I don’t mix it up in a bowl. You can, by just using a whisk, but then you have the dirty whisk, and the bowl to clean up. I just bring out my blender and starting with the wet ingredients first, add them together. Then, just hit the “stir” button on the blender and mix it all up. Mix it for a good 30 seconds to make sure it is nice and smooth. Don’t you just love it already? 2. In a pie or tart pan, rub a little butter so grease the pan (or you can spray with a non-stick spray, which is usually what I do). 3. Cut the cherries in half and remove the pits and stems. 4. 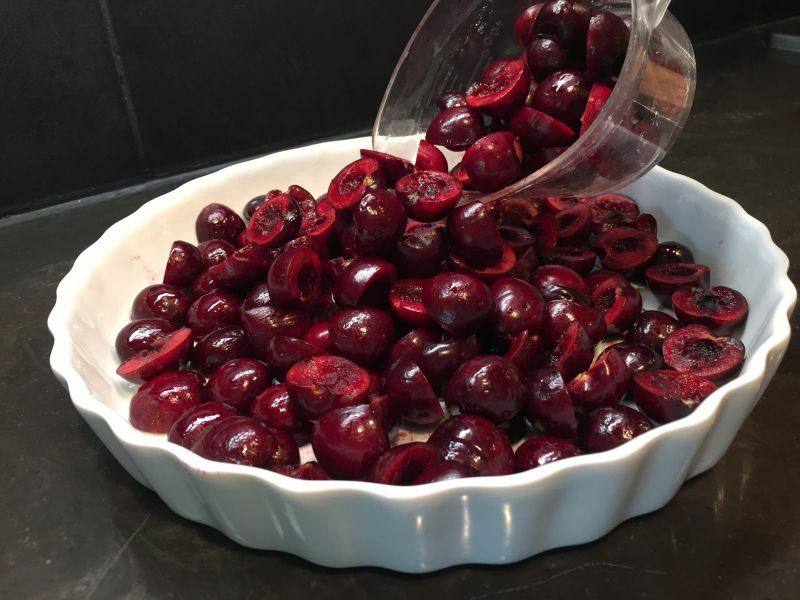 Place the cherries in your prepared pan and spread around evenly with your fingers. 5. Add wet ingredients to the blender or bowl, followed by the dry ingredients. 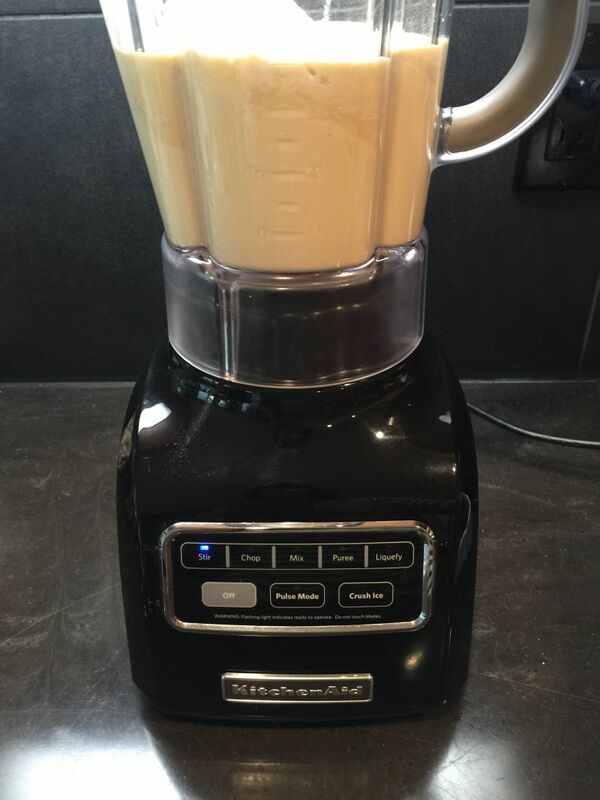 If you are using a blender, mix for about 30 seconds so your batter is smooth. If you are mixing by hand, use a whisk and mix until there are no lumps and batter is like velvet. 6. 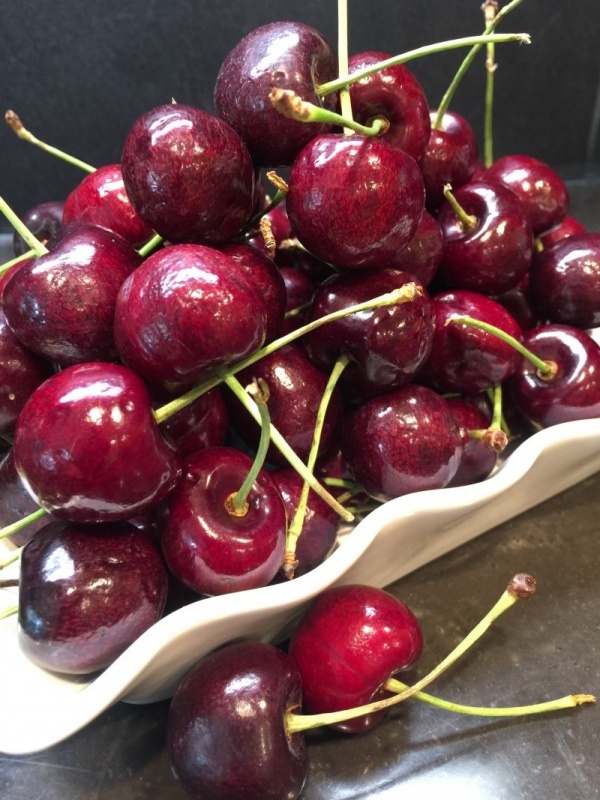 Pour batter over the cherries. 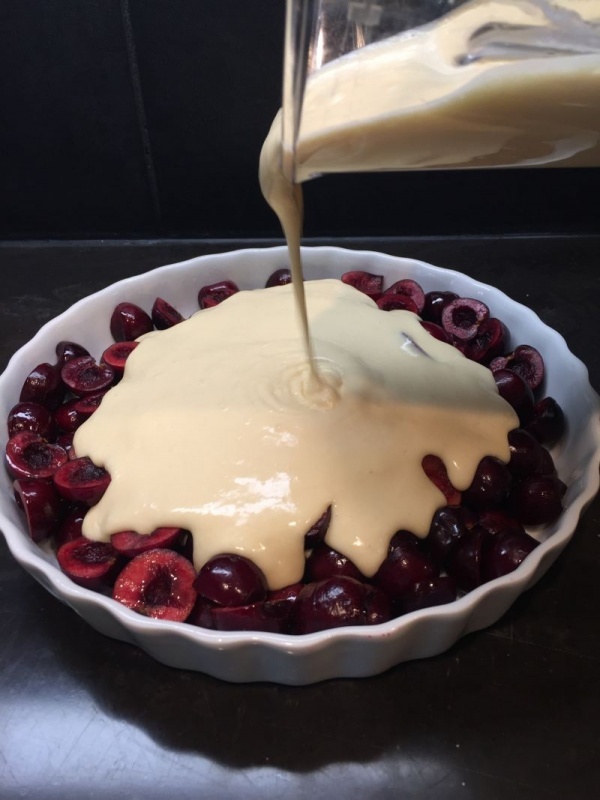 If you like you can reserve some cherries and place them on the top of the batter randomly, so they all aren’t “covered” in batter. 7. Bake 40-45 minutes or until golden around the edges. Do not overcook! This delicious French treat is best served warm. Definitely let it cool down, because it does not slice and serve well if it is too hot. I prefer to serve it at room temperature, so feel free to make it ahead of time! Garnish with a scoop of ice cream if you like, or a dollop of whipped cream! oh my goodness that looks so amazingly good! !